A picture tells a thousand words, but this illustrative power can also be used to mislead – to prop up unsubstantiated claims or for propaganda. So when are photo-fakes most likely to appear, and how can journalists spot them? At the Global Fact-Checking Summit in London yesterday, experts discussed the methods people use to create fake images, and the ways these photos can be debunked. "Where it becomes problematic with the spread of these images," explained Julian Rademeyer, contributing editor of Africa Check, "is how do you tell fact from fiction?" "If someone actually comes up with genuine hard fact, the automatic reaction for many people as well is 'does this really depict this event?'" Rademeyer highlighted situations where photo-fakes are most likely to appear, joined by Tetiana Matychak, editor-in-chief of Ukrainian fact checking site StopFake. And while fact-checkers do have to deal with photoshopped images quite often, Rademeyer points primarily to photos taken out of context as a common challenge. Using images taken in other parts of the world to accompany a different story or illustrate an unrelated point is a common way photo-fakes can end up on our screens, he explained. 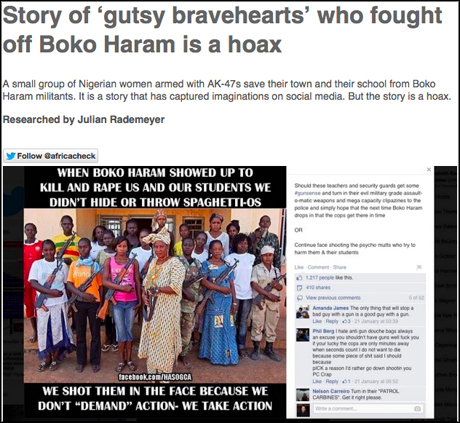 One example is the case of the "gutsy bravehearts who fought off Boko Haram", which was not at all what it claimed to be on social media, but an image taken in Mali in 2012. This tactic is also used in Ukraine, sometimes in combination with image editing tools, as Matychak explained how a photo claiming to show American tanks near the Ukrainian region of Mariupol was in fact a photograph taken in Texas a few years prior, with Ukrainian symbols added in. But sometimes misleading images do not necessarily crop up with malicious intent. One situation Rademeyer has been keeping an eye on is the use of news images as stock photos. "I suspect this is something that's happening around the world. Many of our news websites now when they publish stories... the stories have to be accompanied by an image." He has spotted cases where reporters have gone to a wire service to search for an image illustrating their story and picked images from real news events to publish alongside their articles. The pressure to accompany each article with an image, heightened by the fact more visual posts see better user engagement on social media, can lead to cases where "someone... put himself in extreme danger to take an image of a particular news event, and some hack sitting in an office in Johannesburg decides 'I need a picture of a burning car' and grabs the first one they can." So how can you ensure you're not falling for a fake viral image? Rademeyer and Matychak shared some of their key fact-checking tools and processes. Reverse image search tools such as TinEye or Google Image Search should be the first step. "Upload the images, compare the results and look for the clues, the details," said Rademeyer, pointing again to the image of women allegedly standing up to Boko Haram – debunked partly because one of the women in the photo was wearing a T-shirt with the Malian flag. Exif data, which can provide useful information about the device used to take the photo and in some cases even the location of the shot, can also be helpful if it can be accessed. 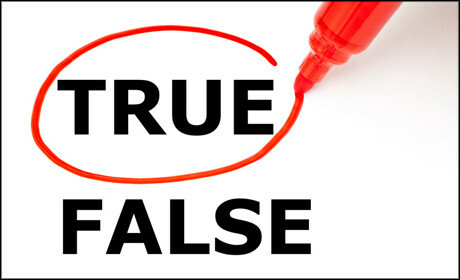 The file name can sometimes give away a fake, as the person who lifted the image initially may not have changed it in the process. To spot edited images, Matychak recommended fotoforensics.com, a free tool that detects when an image has been Photoshopped and which elements have been edited. She also explained the importance of checking through related videos, as the image you might be trying to trace could be a screenshot from a film.